For someone as disorganized as a human being can be, my love of large ensemble music might not make sense. Yet, I am continually blown away at how the different voices mix, how melodies are passed from section to section, and his the rhythm section is so important. It's hard not to fascinated how composers and arrangers take the sounds they hear in their head, turin them into notes, and then back into notes. It's the adding back of the human element that thrills. Modern big bands are often filled with the most talented musicians who subsume their egos for the better of their collective. Each one of the albums listed below includes songs with great solos but, for this listener, it's often the "amazing swirls of sounds" that remain long after the album is over. 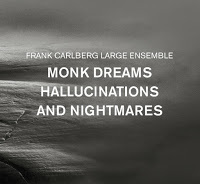 Pianist, composer, and arranger Frank Carlberg released "Monk Dreams, Hallucinations and Nightmares" (Red Piano Records) early in 2017, the centennial year of Thelonious Sphere Monk's birth. The music sparkles with inventiveness, Monk melodies weaving in and out of intelligent arrangements, powerful solos on every song, etc. 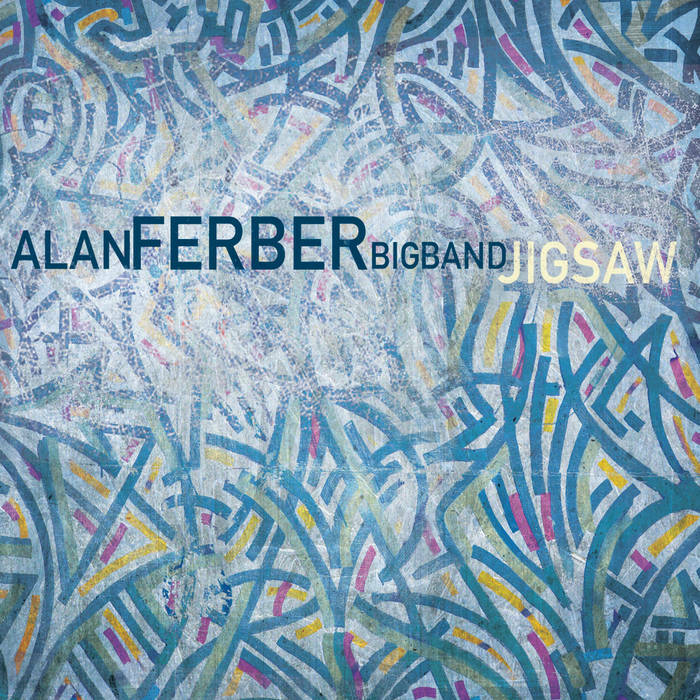 The album culminates with an amazing take on "'Round Midnight", an 11-minute meditation on the classic song with Kirk Knuffke's cornet in front the entire time (perhaps the finest recorded solo of a great year of solos.) 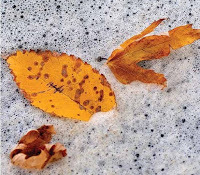 Like the music that inspired it, this collection sounds fresh each time you listen. 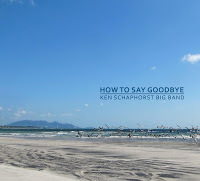 "How To Say Goodbye" (JCA Recordings) was issued in late 2016 (as was the album above) - a star-studded large ensemble (powered by drummer Matt Wilson, no less), it was the first Big Band album composer, arranger, and educator Ken Schaphorst in 18 years. It's such a treat to hear how the sections work together and independently, how the melodies lead to exhilarating solos, how the myriad of influences in the composer's life helped shape such original music. The results live and breathe, entertain, challenge, without pushing the listener away - in fact, more than once after the last track ended, I would go back to the beginning and listen again. 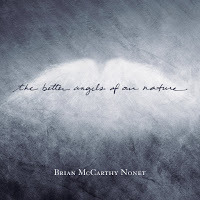 Took me a while to come around to appreciate just how good "The Better Angels of Our Nature" (Truth Revolution Records) is. A long-time project of saxophonist and arranger Brian McCarthy, the music inspired by the first Inaugural Address of President Abraham Lincoln (1861) was created for nonet, an ensemble that allows the arranger to plays with his aural palette in so many creative ways. In a year of such turmoil as 2017 has been, this album serves to remind one that the United States has seen such roiling times in the past and survived, fresh scars each time but with the desire for improvement. Music can help; it cannot change the world but does often remind us that our "better angels" are often close-by. Yet another album issued in late 2016, "Jailhouse Doc With Holes in Her Socks" (JCA Records) is the latest aural adventure from composer and arranger Darrell Katz. Dedicated to his late wife, Paula Tatarunis (1962-2015), much of the music uses her poetry as a stepping stone to fascinating melodies and creative arrangements - Katz has always been influenced by Julius Hemphill and the long version of "The Red Blues/Red Blues (Live)" that closes the disk shows how that influence has evolved into Katz's "personal" sound (also features the unique voice of saxophonist Oliver Lake. Utilizing various sized ensembles as well as the expressive voice of Rebecca Shrimpton, this music is quite powerful and rewarding. If this was saxophonist, composer, and arranger Chelsea McBride's debut recording, it would easily be one of the debut albums of 2017. A young veteran of the Toronto music scene, Ms. McBride is quite busy, leading several different ensembles and member of several others. 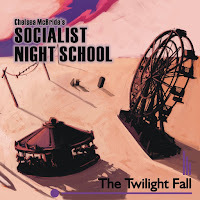 "The Twilight Fall" (Brontosauras Records) is the full-length debut of her Socialist Night School, a 19-piece aggregation complete with a vocalist, powerful electric guitar, plus the oft-rampaging drums of Geoff Bruce. Alex Samaras adds emotionally rich vocals to a number of tunes but, for these ears, it's how Ms. McBride uses the various sections of the band to enhance the narrative and to keep the music moving forward. There are various influences from the jazz and blues side but also nods to rock music, Latin and much more. Attractive music that shows vitality and maturity as well as the desire to go in different directions. 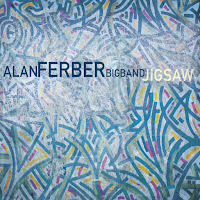 Trombonist, composer, and arranger Alan Ferber created "Jigsaw" (Sunnyside Records) for his Big Band. It's that ensemble's second album and shines so bright with originality, solos, intelligent and challenging material as well as being emotionally rich (in that way, reminiscent of the work of Maria Schneider and Bob Brookmeyer). The seven pieces are just "vehicles for blowing", although there are no shortage of impressive solos. Yes, this band can roar but it's the blend of the quiet moments, the introspective melodies and harmonies, and those moments when the musician let loose that gives the music its humanity. Kenny Wheeler's big band music is held in high regard by music scholars but is not in the repertoire of many large ensembles. 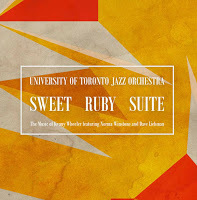 "Sweet Ruby Suite"(UofT Jazz) comes from the University of Toronto Jazz Orchestra, Gordon Foote director, and finds the student ensemble interpreting the Canadian native's music alongside saxophonist Dave Liebman and Wheeler's long-time associate, vocalist Norma Winstone. To the band's credit, they hew closely to the original Wheeler arrangements. What stands out to this listener is how well the ensemble plays, how the soloists give it their all each solo, and the timeless quality of Kenny Wheeler's work. Right around Thanksgiving, I received a huge package from the University of North Texas as the program is celebrating its 70th anniversary. Slowly but surely, I am making my way through recordings that show the strength of the program's various ensembles, the different arrangers, and numerous fine young soloists. Those recordings and the one from the University of Toronto serve to remind us that jazz has not disappeared, that there are people who want to learn more and play for audiences, that if you stop worrying about the commercial intent of certain art forms, they can and will survive. . In the final chapter of these four posts, I'll look at smaller group recordings, solo and duo albums, and more. Be well all!